It is always gratifying to encounter a book for which one will write a glowing recommendation. If it were acceptable to the editor, this review would end here with the proviso to purchase (or at least read) this volume right away. However, one is always expected to do one’s duty. As a result, it should be said that the co-authors of this book, Robert K. Wittman and David Kinney, have done a masterful job of recounting not just an interesting story but one which is all of the following: a mystery, a detective story, and two biographies wrapped up into one tale that additionally sheds light on one of the lesser known and obscure figures of the Third Reich, Alfred Rosenberg. Wittman is a former FBI agent who parlayed his modern-day “monuments man” responsibilities for the government into an art recovery consultancy, and Kinney is a Pulitzer Prize-winning reporter and author. Their collaboration in this instance is highly commendable. 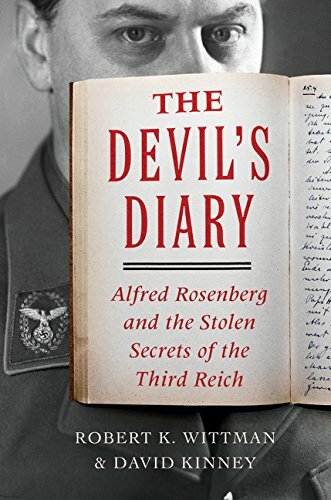 The mystery surrounds the disappearance of Rosenberg’s ten-year, 500-page diary following his conviction at the unique postwar Nuremberg trials at which many of the leading Nazi figures were tried for various and, for most, multiple war crimes. A minor German government functionary, Robert Kempner, dismissed from his job because he was Jewish and eventually making his way to America, assisted the American prosecution’s case and, once Rosenberg was convicted, made off with the diary and other government documents. Therein lies the detective story. Wittman collaborated in the 1990s with the chief archivist at the United State Holocaust Memorial Museum to locate and then obtain the diary and other materials from Kempner’s estate. The result was a years-long and frustrating struggle to find them with the added difficulty of legally regaining these items, complicated by the objection of Kempner’s wife and his mistress to part with them. With possession regained, the story diverges as the life stories of both Kempner and Rosenberg are recounted. Kempner (with wife, mistress, and two sons), unlike many Jews in Germany, was able to escape the Holocaust, come to America, and make himself available to the FBI and other government agencies, given his prewar knowledge of and experience with the Nazi state; this explains his participation in the postwar trials. In effect, Rosenberg was the Nazi Party’s philosopher and ideologue, conceptualizing many of the racial theories that underpinned the Nazi system. His evidently ponderous opus magnum, Myth of the Twentieth Century, was second only to Hitler’s Mein Kampf in popularity on German bookshelves and earned him a small fortune. With the war ended, Kempner had come full circle and found himself, in Nuremberg, face to face with Rosenberg at the trials at which the latter was convicted and ultimately executed in 1946 for his role in the war. Besides the story itself, each chapter is headed by a relevant photograph. An index and two appendices are included. These provide a “Third Reich timeline” and a cast of characters found in the text. The bibliography shows research in materials from the National Archives and other archival sources as well as journal articles and books, German and American. Obviously, Rosenberg’s diary itself is heavily quoted to give additional context and insight into his thinking inasmuch as it is rich primary source material for scholars who want to probe the “rationale” or basis behind the thought processes of National Socialism. Considering the interesting and multiple subplots contained herein and wider possible public exposure of Alfred Rosenberg and his racial theories, this volume cannot be recommended too highly. It is another smoking gun with which to condemn the Third Reich and further serves to reinforce what has become a 70-year mantra: We should never forget nor, more importantly, repeat man’s worst inhumanity to man.